Good People, Bad Things is written and performed by Daniel Thau-Eleff. What is the nature of evil and why do ‘good’ people sometimes do ‘bad’ things? 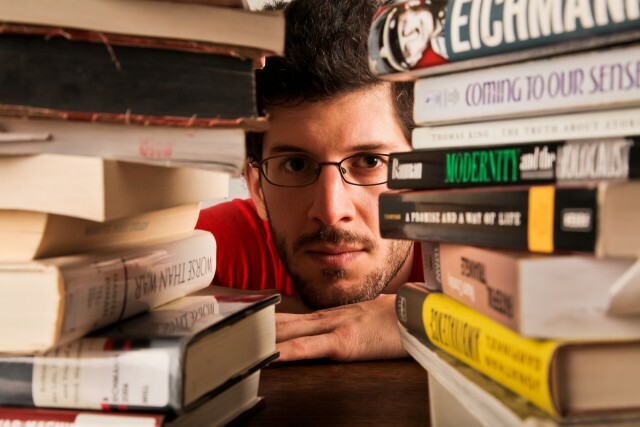 Playwright and activist Daniel Thau-Eleff wrestles with these questions in a personal-political monologue that will be presented twice next week at Brandon University (BU). The Winnipeg-based Thau-Eleff will perform his acclaimed “Good People, Bad Things” both Thursday at noon and Friday at 3:30 pm. in the Evans Theatre at Brandon University. The 50-minute show is free to see, and will be followed by a post-show talkbalk session. Dealing with examples as wide-ranging as Adolf Eichmann and the Nazis through the current Israeli/Palestinian conflict and zeroing down to a matter as personal as a couple whose relationship becomes abusive, “Good People, Bad Things” has been receiving excellent reviews since it premiered in Winnipeg in 2012. It’s since been presented in Toronto, Halifax, Vancouver and Charlettotown. Daniel Thau-Eleff leads students in a workshop on Monday evening. The play has been called “A beautiful tapestry of hope and hopelessness” by both the CBC and “Ambitious, political, intense” by the Winnipeg Free Press, who each gave it a four-star review. It is being hosted by the Creative Writing Program at Brandon University and the Moving Target Theatre Company. The Friday performance is also part of the BU Faculty of Arts Speaker Series. 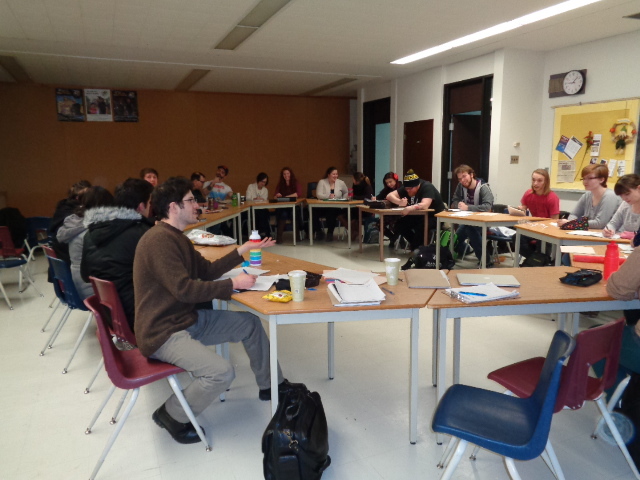 On Monday evening, Thau-Eleff was on campus for a workshop to explore writing from personal experience. He guided participants through writing exercises designed to teach them about writing and tilling the creative soil.